The Anatolian Shepherd is a large, rugged and muscular dog breed with both the speed and the stamina needed to guard livestock all day. They are not a dog for inexperienced owners as they are independent with a mind of their own. They were originally bred to tend their flock without any human instruction or assistance. Unsurpassed livestock guardians. Brave and self-assured, legend has it they are able to fend off bear and wolf attacks. The Anatolian Shepherd originated in Anatolia (central Turkey). 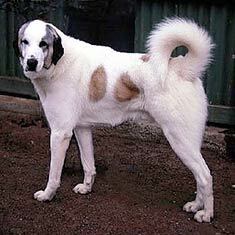 Male Anatolian Shepherds range from 27 to 30 inches. Female Anatolian Shepherds range from 26 to 28 inches. 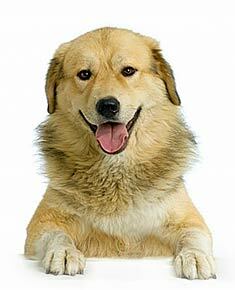 Male Anatolian Shepherds range from 100-150 pounds. Female Australian Shepherds range from 80 to 120 pounds. Anatolian Shepherds may be of any color patterns and markings, including fawn and brindle. The Anatolian Shepherd's coat can be short (one inch) or rough (about four inches). The coat requires little care except during seasonal shedding twice a year. Anatolian Shepherds are alert and intelligent, calm and self-assured. They are brave and territorial, instinctively protective and natural guardians. Loyal and loving with his family, he is reserved around strangers. Some Anatolian Shepherds are prone to eyelid entropion or to hypothyroidism. Hip dysplasia does occur but it is not as common as with some other large breeds. They are sensitive to anesthesia. The expected life span of the Anatolian Shepherd is 11-13 years. Anatolian Shepherds need frequent exercise and therefore do best in a house with a fenced yard and long daily walks. They do best when they have a job to do. The Australian Shepherd is in the Working group. Find Anatolian Shepherd Dog Puppies with our Free Breeder search!